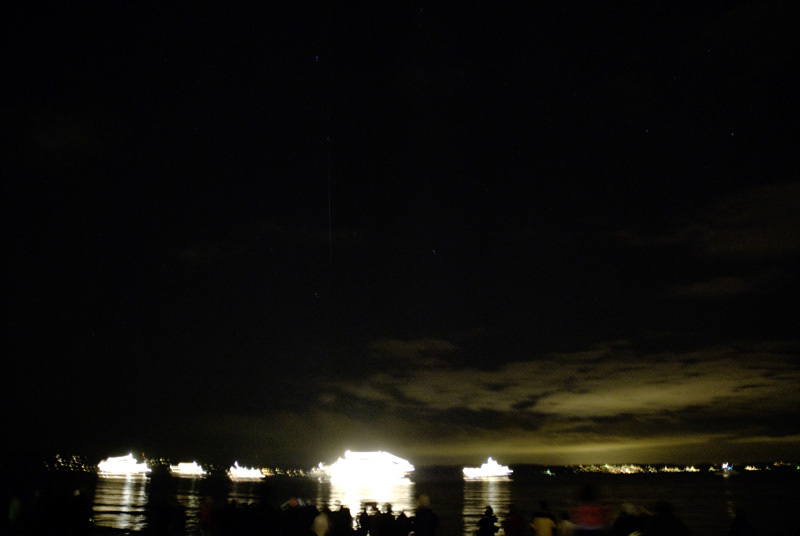 We saw a couple of Geminids this evening while we were out watching the Christmas Ship at Lowman Beach in West Seattle. (For those of you who don’t know, or those of you not in Seattle, the Christmas Ship is a local tradition that’s been going for 60 years. Argosy cruises takes a choir and a majorly awesome sound system out on a cruise around Seattle. They stop at various beaches where folks are gathered and sing (from afar) Christmas carols at you). These pictures are copyright 2009 to Jason Gift Enevoldsen. If you’d like to reproduce them please credit him and let me know (alices astro info at gmail dot com). Click to see bigger.